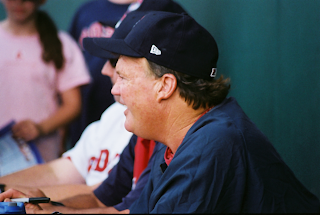 Ron Johnson came to the Red Sox in 2000. He was the manager of the Sarasota Red Sox until 2002, when he was promoted to Portland! Except it wasn't Portland back then, it was Trenton. Portland was still home of the Marlins AA team. RJ hung out with the Sea Dogs when they moved to Maine and wrangled the kids for a couple of years. Kids like Hanley Ramirez! In 2005, Pawtucket welcomed a new manager. Where Buddy Bailey was a yeller, a bully, a Lou Piniella type, Ron Johnson was friendly and encouraging and supportive. Total Theo-nomics. The 2005 PawSox (75-69) did not make the playoffs. Kelly Shoppach cranked out 26 home runs. Tim Kester and Abe Alvarez led the team in wins with 11. Cla Meredith was working it out as a young reliever. Adams Hyzdu and Stern roamed the outfield... some guy named Mitch Stachowsky (who?) played catcher a few times. And 21-year-old Dustin Pedroia was called up from Portland, beginning his ascent into Boston history. 2006 was a bad year for the Pawtucket Red Sox (69-75). Forgettable alumni: Mario Pena, Dustan Mohr, Tyler Minges, Barry Hertzler, Brad Baker... so many more. Boston finished third in the AL East that year, too. So many injuries, so many crappy relievers. Wait, I'm getting sidetracked here... In 2007, the PawSox record under RJ lost a little bit more, going 67-75. Exciting kids like Ellsbury, Brandon Moss, Jon Lester, David Murphy, Jed Lowrie and Clay Buchholz were on the way up and out. So who cares about wins and losses? Oh, wait, me, that's who! I very selfishly wanted the PawSox to be a winning baseball team and not a player development/preparation machine. Many times I wondered... how does RJ handle this? Doesn't a manager want the team to win ball games? Doesn't it kill him to blow a game by putting in Keith Foulke for a couple of rehab relief innings? BECAUSE IT SURE AS HELL KILLED ME!!! (see also: Rochester). Someone asked RJ this question during a hot stove Q&A and he responded thusly: Yes, at first it was hard, but now he understands his role and the bigger picture. As in, when Boston wins, Pawtucket WINS! Even if they lose to the Ottawa Lynx or something. That was a very diplomatic thing for him to say... but was it 100% honest? I can't believe that there isn't one particle of disappointment at a team loss... and what do you say to the youngsters who're still balancing competitiveness with development and training and crap? So, yeah, that's what Ron Johnson said and he's probably telling the truth. I'll bet his job is really hard, maybe just as hard as managing a major league team. In MLB, the goal is winning ball games. How hard is that? Plus you still have to babysit, which is possibly the most irritating part of the job. No matter where you work, dealing with interpersonal conflict never ends. In 2008, the Pawtucket Red Sox broke the franchise win record when they went 85-58. They also made it to the playoffs, but without some of their best players, they didn't last long. So that was good. 1. This year, Ron Johnson won the J. Vincent Cuddy Memorial Award for... being a good manager, I guess? Some Rhode Island sportswriters gave it to him. Maybe it was recognition for have Jeff Bailey bat leadoff. 2. RJ was offered football scholarships to UCLA and Fresno State, but opted to play baseball. 3. RJ's son, Chris Johnson, was promoted to triple-A in the Houston org. last year. CJ plays third base. 4. RJ enjoys horseback riding at Lincoln Woods, which is like around the corner from me. He should watch out for Marsh Monsters! 5. RJ is returning to Pawtucket in 2009. He could be around for a while. Ron Johnson is loud, gregarious, friendly, smart, witty... loud. Ask him about any player he's ever coached, and he'll describe the guy as classy, terrific, one of his favorite players, a beautiful person. RJ's also a great public speaker...a very funny and self-effacing raconteur. Damn straight this guy gets a portrait on the McCoy ramp. Right next to Ellis Burks! Marsh Monsters, OH NO!!! She's right RJ. Those rascals are very elusive and dangerous, at least that's what I've been told by someone who knows.